Nutrient Removal Oyster reefs remove nutrients from the water by enhancing denitrification rates and incorporating nitrogen and phosphorus into tissues and shell. Image courtesy of Dr. Lisa Kellogg. Fieldwork Dr. Lisa Kellogg prepares to retrieve sample trays from the restored oyster reef. Photo courtesy of Dr. Ken Paynter. Laboratory Experiments Researcher Mike Owens of the University of Maryland Center for Environmental Science sets up incubation chambers in the laboratory to measure changes in the concentrations of nitrogen compounds, phosphorus, and oxygen. Photo by Dr. Lisa Kellogg. 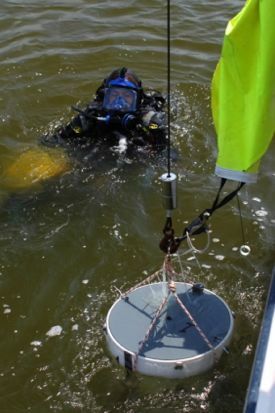 A study led by researcher Lisa Kellogg of the Virginia Institute of Marine Science shows that a restored oyster reef can remove up to 10 times more nitrogen from Chesapeake Bay waters than an unrestored area nearby, providing additional evidence that reef restoration can contribute to efforts to improve water quality in the nation’s largest estuary.